A misty moisty morning in Mynytho, at the tip of the Llŷn Peninsula near Abersoch, searching out another group of wells was the catalyst for a rare bout of philosophising of the “why are we here, where are we going” nature. We have previously reported on Mynytho’s “holy well” Ffynnon Fyw, an impressive dry stone, two basin edifice which alternates between a state of overgrown-ness and cleanliness at regular intervals. Today I was on the lookout for three other wells that merit a mention in Francis Jones’ book The Holy Wells of Wales. Which prompted the question, why does a relatively small place like Mynytho, not even a parish in its own right, merit having four notable wells in the record? Then , once having seen the wells, what even merits their inclusion? I have on the blog mast head “exploring the holy wells and healing wells of North Wales”, so how do I know when I am straying from the point, is there a marker and does it ever matter? It cannot be stressed too often that everything relating to wells, whether in early form or in mangled survival, traces to one subject – religion. Which in effect allows him carte blanche to include any named well in his gazetteer. Of course access to water is an inescapable necessity of life, and thus from the earliest times maintaining a reliable source of water would be paramount for a community to survive. It is inevitable and natural I suppose that practices and customs grew up around a water source. With springs subject to the vagaries of nature which maybe were not always fully understood, then maybe more ritual practices grew up to celebrate the water source. Healing too relies on clean water, being free of impurities to wash with or maybe containing specific important trace minerals and elements. By trial and error it might be found that specific wells appeared to be efficacious in treating particular minor complaints. It is undisputed that water cults were an important way of life back before recorded history, at wells, rivers and lakes, and evidence is widespread on the breadth and value of objects seemingly being offered to water sources. Whether we jump from this to stating everything well related leads us back to religion may be a little overstating the mark. I’m well aware that opinions vary. 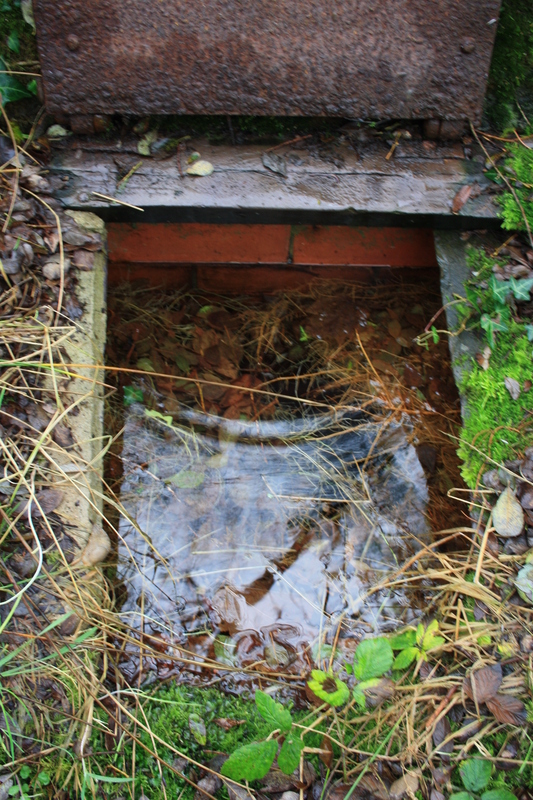 Since so often the history of a given well has not been recorded it is difficult to sort them into their true categories and any anonymous well may be a now forgotten “holy well”. The generality appears to be a case of hedging ones bet, if a well is named, and has any element of folklore attached to it, then we may treat it as a potential holy well. A recent study by Elfed Gruffydd found 17 named wells at Uwchmynydd, a small dispersed community near Aberdaron at the tip of the Llyn Peninsula. As he points out, this doesn’t indicate anything special about Uwchmynydd, it is merely indicative of the numbers of wells that would have once existed across the area, and indeed the country in general. One this basis we can turn full circle from the surprise that Mynytho boasts so many wells to the idea that it actually as so few. Of course, as Elfed Gruffydd points out, it is all down to recording. It is a benefit of the nature of the community around Uwchmynydd that so many named wells can still be identified. In other communities the connections with the wells was lost much earlier, and the larger the settlement, the earlier that transient populations, spread of housing and the demands placed by people and industry on water supply have led to a loss both of wells and of well customs and well names. The presence and absence of names is everything. It is often stated that Jones research finds so many more wells in South Wales than in the north.236 in Pembokeshire, 160 in Glamorgan but only 88 in Caernarfonshire and 35 in Anglesey.Jones admits that being in South Wales he had better knowledge of that area, and probably a greater level of earlier recording had taken place. Even in the north there is a high level of variation. Anglesy musters 35 wells in total; in Jones’ record against Uwchmynydd’s 17. The Llŷn is fortunate that folklorist John Jones, who wrote under the pen name Myrddin Fardd lived and worked there. Indeed he attended school in Mynytho in the mid nineteenth century. His 1908 book Llên Gwerin Sir Gaernarfon is a primary source for Jones list of Caernarfonshire wells, he cites Fardd as a reference for about 36 of the 88 wells he notes. Thus the conclusion of a wet walk around Mynytho is that perhaps it’s hardly surprising that we have so many wells to find here, local boy Myrddin Fardd ensured that the names and customs, at least as they stood and were remembered in the middle of the nineteenth century, were set down and recorded. Whether they were specifically “holy wells” may depend on your definition of “holy” they were not specifically linked to a saint or church, but they had legends and uses attached to them which some people might seek to attach an unbroken link to some pre Christian customs if they wish. For the time being I will avoid that. We find Ffynnon Sarff on the western side of Mynydd Mynytho following a footpath across Mynytho common. The well is still marked on the current OS map. 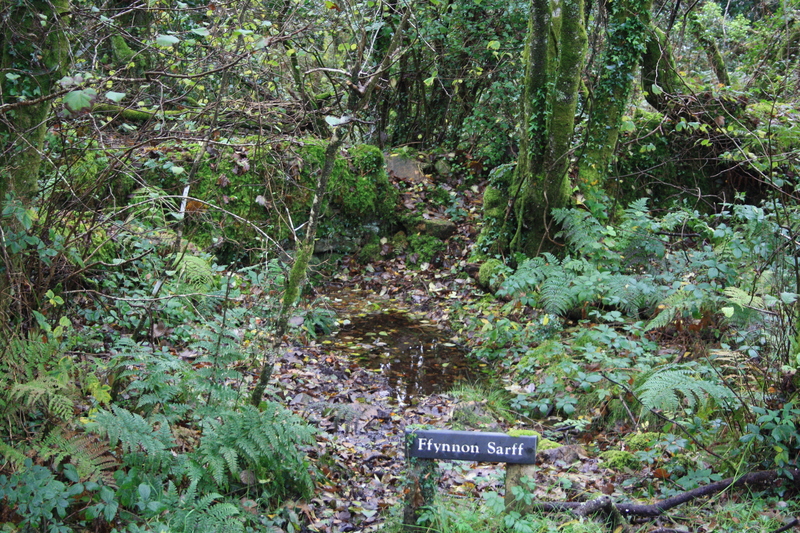 It is beside a wooded area known as Gwinllan Sarff. Gwinllan normally translates to “vineyard”, though I think it can also be translated as “grove” which I think is more realistic in this case, I am not aware of a vineyard having been here. The name Sarff means serpent; and Fardd recounts the legend of the well having once been the home to a dangerous poisonous serpent. Fardd treats the story with respectable caution saying it was unclear whether the well gained its name from the adjacent woodland or vice versa. The serpent tale is the sum total of the well’s interest, with no obvious holy or healing links. The well today is marked by a signboard, but is used as a water source by a nearby house so should not be disturbed to avoid dirtying the water. Ffynnon Saethon lies some mile to the north of Ffynnon Sarff. Fardd describes it as a substantial structure, some three to four yards long and two to three yards wide. It produces a strong stream of pure water. It is believed that it was used for both summer and winter bathing in the distant past, and also that pilgrims would be drawn to it. In Fardd’s time it was better known as a well for divination. The youth of the parish would gather beside the well and throw pins into it, a pin floating indicated a strong pure love, while a pin sinking signified unfaithfulness. 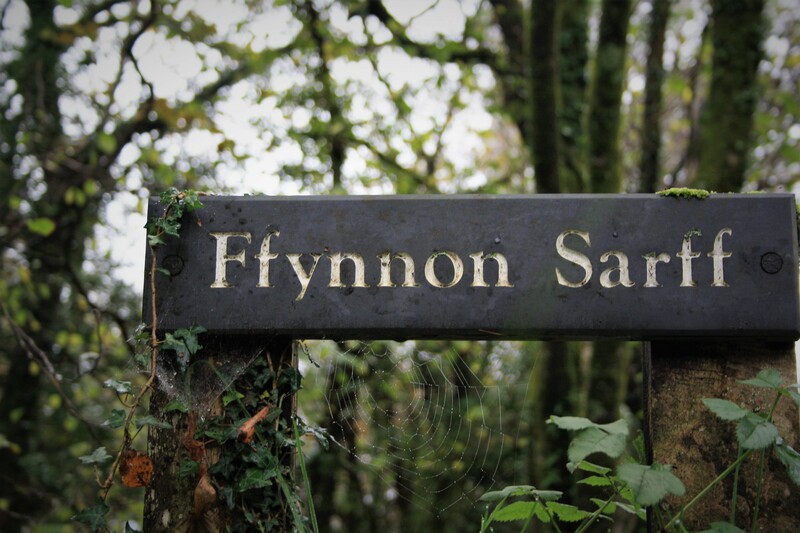 Fynnon Saethon currently lies on private land, and on this occasion I was unable to gain access. A report from 2005 shows it as a brick and stone structure which retains a strong flow of water. 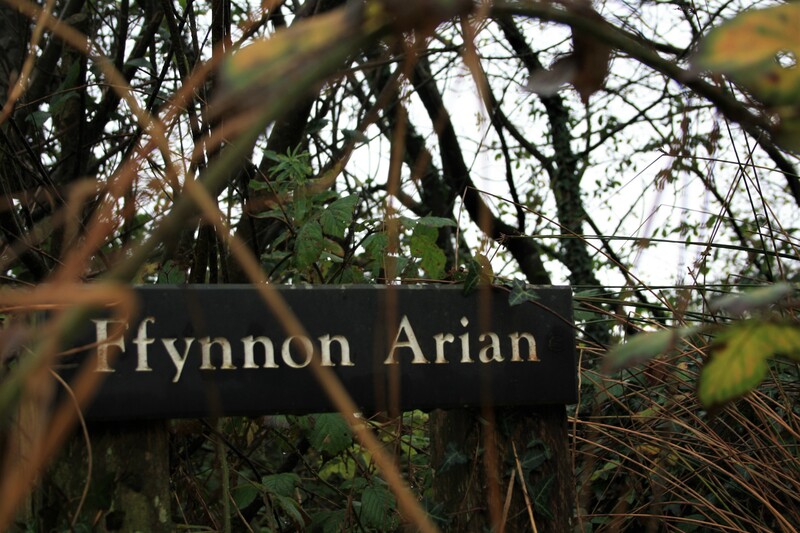 Ffynnon Arian lies close to the school on a grass verge beside the B4413 running through the village, this too is marked on the OS maps and also by a name board beside the well. It is also a brick and stone structure with a hinged iron lid on the top. 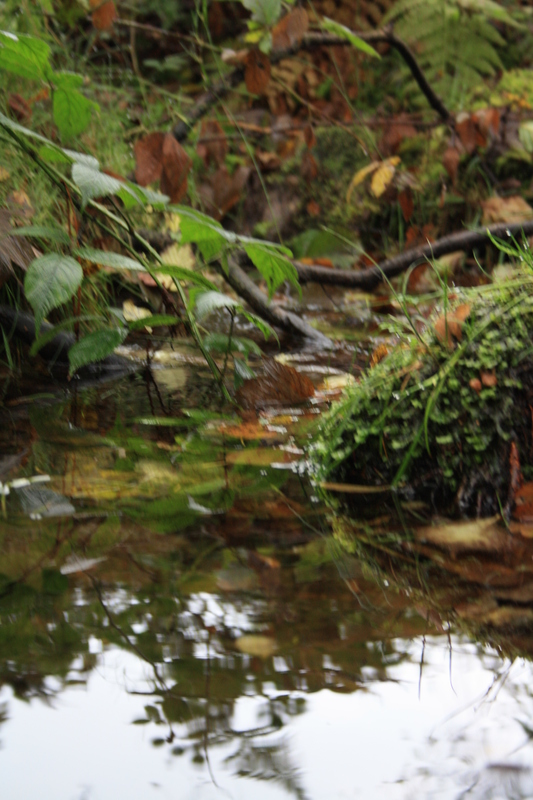 Again water appears to flow freely; the spring is full and ground around it boggy. This site is intriguing by the fact that it doesn’t appear in Fardd’s list of wells; one would assume that if it was of significance during the time he was there that he would have mentioned it, although it does appear as a named well on the 1914 OS maps. The only place I find it reported is in Jones where he identifies it as a wishing well without providing any source for this. So it is, then that we add these three Mynytho wells to our own catalogue here. No records of Christian religious significance or of healing qualities, they seem to belong to nearby Ffynnon Fyw. Instead we have a collection of poisonous snakes, divination and wishing wells, all a link back through history, folk memories all of a pre-Christian belief set, holy wells in that respect? That is something that can never be satisfactorily demonstrated, so in the meantime we move on regardless. Interesting article. While in Britain, our group visited a few “holy” wells. Wells and springs have always held a place of mystery in our collective awareness, speaking of the flow of waters (consciousness), purity and vitality (water is vital for health). Fascinating discussion for I have just been pondering something similar myself and wonder like you, that if a well has a name, it distinguishes it from others as somehow different – the differences could be very diverse. Really it seems a well can be holy if someone, for a whatever reason, believes it is! Farm well just indicate ownership, others are like Cold Well or Fresh Well again may indicate a property which is important though not necessarily making them holy. I agree with your final point – it is really belief in the powers of a well – whether healing or holy – and the distinction between the two if there is one is something I’m not sure about – the belief is what makes it special. Thank you for all this detail. Will have to visit. I have a collection of various water samples and hope to get a microbiologist to look at them. I think the work and information you share on wells very interesting.